Energy & Utilities Technology Solution, Integrate Smart-Grid Systems and Business Intelligence Systems - Chicago, Oak Park, Evanston | MXOtech, Inc.
As energy & utility systems modernize to serve households, communities and industry, MXOtech can come alongside you to leverage growing 21st century data & integration solutions. Creating fast, reliable solutions to integrate smart-grid systems and business systems, applications and web portals. Utilities that are connected face the challenge of leveraging big data to better tune business decisions. MXOtech can partner with you to navigate this data so that it becomes useful information for your business and customers. We’re witnessing the revolution of the connected home & industries—monitoring systems & machinery, smart thermostats, remote appliances, turning things on & off with your voice. The grid that runs the neighborhoods, communities, and industry is also in a revolution—transforming away from passively transmitting electricity and water. Advanced Meter Data Management Systems (MDMS), Automated Metering Interface (AMI), Outage Management Systems (OMS), grid safety protocols are connected to the backoffice systems of your organizational enterprise: Customer Relationship Management, Resource Planning, inventory controls, and finance & billing systems. The connected home & industry with the connected Smart Grid offers enormous opportunity for analysis of consumption/usage patterns so that Utilities can distribute usage in the most efficient, effective, and economical manner possible. 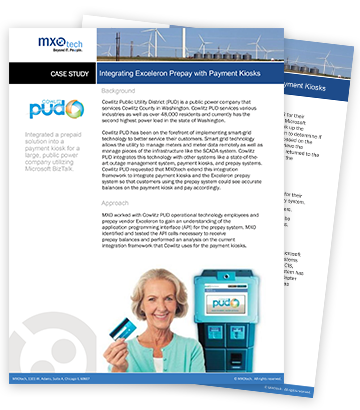 Read how we integrated a prepaid solution into a payment kiosk for a large, public power company utilizing Microsoft BizTalk. MXOtech provides application development, system and data integration, and business intelligence for smart grid technology so that your energy & utility organization can not only keep the “lights on,” but serve your customer base in the most effective way possible.